Dr Brown previously denied the allegations, calling them a “litany of lies,” while Trevor Moniz, who was Attorney-General when the lawsuit was filed, said “Government believes it has substantial claims against Lahey”. In April 2017, Lahey Clinic filed a Motion to Dismiss, and the Bermuda Government subsequently filed in opposition to the Motion. On January 8, 2018, Lahey filed [PDF] a “notice of additional authority issued after briefing on Lahey’s Motion to Dismiss,” and on January 22, 2018, the Bermuda Government filed [PDF] a “Supplemental Response in Opposition” to Lahey’s motion, saying their Motion to Dismiss should be denied. The January 22, 2018 filing from the Bermuda Government in response to Lahey’s filing alleges that, “For nearly two decades, Lahey, acting from its Burlington, Massachusetts-based headquarters, orchestrated a complex scheme that resulted in Bermuda’s payment of tens of millions of dollars for services begotten by Lahey’s bribery and corruption of the highest levels of Bermuda’s government. The motion to dismiss was then heard, and in March 2018 the court ruled. “The question presented in this case is whether Bermuda may bring an action for the various injuries alleged under RICO’s private right of action. “It may well be that Bermuda’s allegations as to Lahey’s commission of various predicate acts would suffice for criminal charges under §1963[a] or civil enforcement proceedings brought by the Attorney General under 1964[a]-[b]; however, the focus of this motion is whether Bermuda, as a private party, may bring these charges under §1964[c]. “Bermuda also brings claims under Massachusetts General Laws c. 93A, § 11 [for unfair business practices] and common law claims under theories of unjust enrichment, civil conspiracy, and fraud. “The result is what I had anticipated from the beginning, however given the politically charged nature of the case, and as Attorney-General, the decision to proceed had to be based on sound legal principles, logical analysis, and by an independent assessor devoid of any political influences,” she said. This is to advise that the District Court of Massachusetts has come to a decision in the case that was brought against the Lahey Clinic by the Bermuda Government. I must say from the outset that the result is what I had anticipated from the beginning. However, given the politically charged nature of the case, and as Attorney-General, the decision to proceed had to be based on sound legal principles, logical analysis and by an independent assessor, devoid of any political influences. It was of paramount importance, especially in light of the impending international assessment, that Bermuda affirms itself as a mature financial centre where sound legal decision-making is based on the rule of law. In her decision, District Judge Indira Talwani, as the independent assessor, determined that Bermuda has not shown that it suffered any domestic injury as a result of the alleged bidding scheme and that Bermuda failed to meet the basic showing that the preferred provider scheme led to an economic injury. Consequently, Judge Talwani found that as Bermuda could not show that it suffered any injury within the United States as a result of the alleged scanning scheme, Bermuda’s claims under the Racketeer Influenced and Corrupt Organizations Act arise out of extraterritorial injuries and must be dismissed. 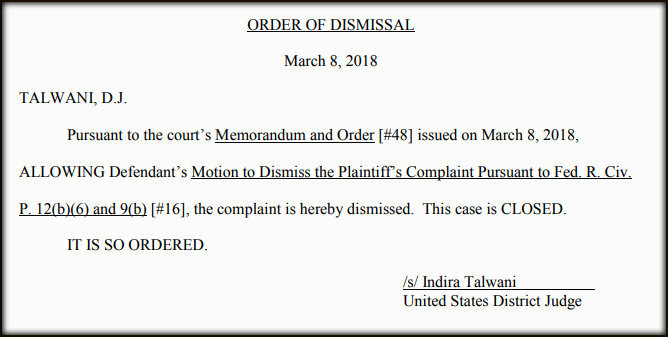 Therefore, Judge Talwani has ordered that Lahey’s Motion to Dismiss the action brought against them is allowed; and therefore she has determined that Bermuda’s claims against Lahey are dismissed, and that the case is now closed. Update 2.53pm: Lahey Clinic said, “Lahey Hospital & Medical Center has a 25 year track record of caring for the people of Bermuda while maintaining the highest ethical standards for all business relationships. We were confident that the claims made in the suit were baseless and are pleased with this dismissal. Update 4.43pm: Shadow Attorney-General Trevor Moniz said, “The dismissal of the Government’s civil case against Lahey Clinic comes as a disappointment. As Attorney-General, I made the decision to issue proceeding following an exhaustive investigation. Throughout the entire process, I acted on the basis of legal advice and in the best interests of the community. “Ultimately, the case was dismissed on a technical ground, namely that there is insufficient ‘domestic injury’ in the US to bring a case before the American Courts. This is a fast-moving area of the law, with the US Supreme Court only deciding to narrow the relevant legal test in the summer of 2016 – well after the investigation into Lahey’s affairs began. A further appeal would be needed to clarify this point. “It is important to point out that the case was based on compelling evidence, and that the complaint was meticulously well-sourced – in many instances, with the very words of those involved. “Finally, it was a great blow to the case that members of the former Opposition, including the present Premier and Deputy Premier, filed objections to the case proceeding,” said Mr Moniz, a reference to the Amici Curiae in May 2017.